We at, CMI Structural Solutions, have been in the foundation business for over 22 years. With over two decades of experience, we are experts in structural engineering and are confident in our process and our services. If you are faced with problematic structural issues, you must hire a professional to observe the area and advice you on how to overcome these challenges. At CMI Structural Solutions, we are interested in three things: challenges, solutions, and results. We want to work our brains to provide you, our customer, with the best structural solutions that will prove effective in the long-run. In our line of work, problems can arise — expensive ones too! Because of this, our goal is to design and construct structures that will be built expertly, on-time, and stable for years to come. When a structure has not been properly analyzed and a stability solution is designed to be temporary, expenses can add up in the form of foundation repairs and maintenance. If you entrust a company that works for you and with you, you can ensure that a long-term solution will be decided and implemented. CMI has installed Stelcor piles in locations all over the state of New York. These piles are drilled into the ground upon application. Their main purpose is to help support large, multi-story buildings. In the project we completed in Fairport, NY, we installed several Stelcor piles in order to support a new, four story building. 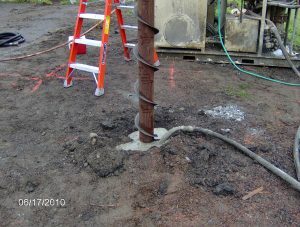 Piles, in general, are a wonderful structural solution because while it is screwed into the ground with added grout, the process achieves positive soil displacement, provides total grout encasement and unique grout interweave. By adding the grout and the newly inserted pile, structures are given permanent strength due to the steel core of the pile. Another reason why piles are a go-to choice for providing structural stability, in that, there are no spoils to the haul of the materials and they can be installed in high water table conditions. They are also easy to install and are permanently implanted into the soil. Underpinning systems are exceedingly useful, in that, they help solve a lot of structural issues a building might have all at once. The system itself is used to strengthen a structure, or an already existing structure. Underpinning aids foundations by strengthening them by adding support and stability against natural disasters, such as earthquakes, floods, and droughts. Underpinning is also useful in providing support for buildings who have had the soil underneath the structure change and lose its strength. Underpinning systems can be applied to foundations to also help improve support. For example, this can occur is a building has changed its weight in anyway, such as new construction or more people using the structure. Probably a more pertinent question to ask when learning about retention systems for a structure is, what they do and how they do it? Retention systems are designed to help support a building in a manner of techniques. After analyzing the soil of the land, CMI then can figure out which type of structural system will be more effective in maintaining a buildings retention. CMI decides then, which system — piles, anchors, or retaining walls — will work better over an extended period of time. Retention systems are wide-ranging because there are many different methods to utilize. In the example of a retaining wall, this structure is designed and constructed to resist the lateral pressure of soil. They are typically constructed in order to restrain soil from moving in two different elevations. It is used especially on terrains that are naturally shaped and need engineering to properly develop the land for construction. Only after observing and analyzing the soil can geotechnical construction begin. More importantly, it is important that you get an informed opinion you trust before diving into a full-fledged retention system. 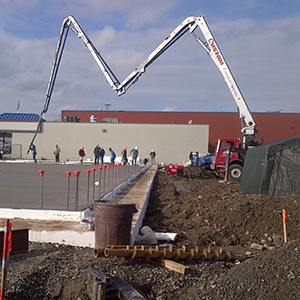 CMI, along with our other services, is able to complete full-foundation projects. This means that we can not only analyze the quality of the land where a building is going to be constructed, but help lay down the foundation of the building and apply the necessary structural supports. CMI Structural Solutions can supply your building foundation with materials and supports such as helical piles, steel grade beams and a geo-joist floor system. This system is important in laying the foundation for the building because it provides insulation and frost protection. CMI Structural Solutions are prepared to handle your foundation needs and are willing to advise and assist you throughout the process. If you are currently in need of a complete foundation creation, you should consider our company. 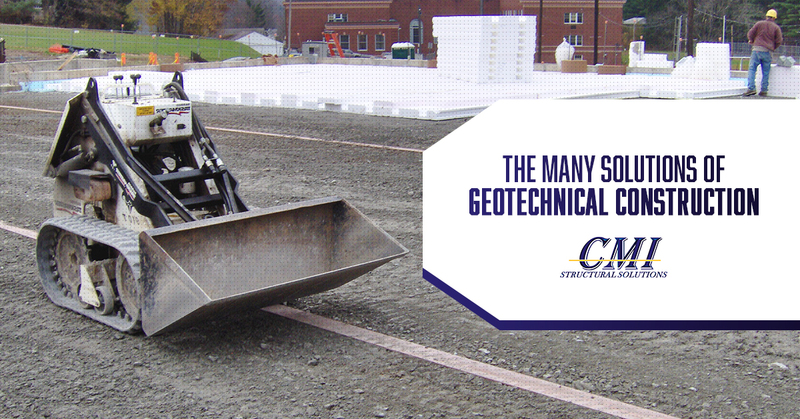 With all of these services and two decades worth of experience, we are your premier geotechnical construction company. We are able to analyze, design and construct, your building foundation. With our knowledge and experience we can guarantee we will complete each project as a job well done. If you are interested, don’t hesitate to contact us today! One of our kind and understanding representatives will be able to answer any questions or concerns that you might have. Contact us today!